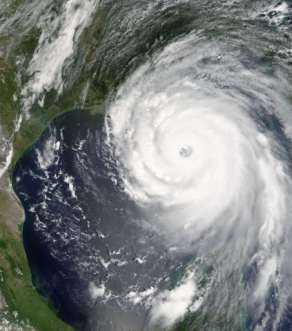 Katrina forever changed the face of the Louisiana & Mississippi Gulf Coast. 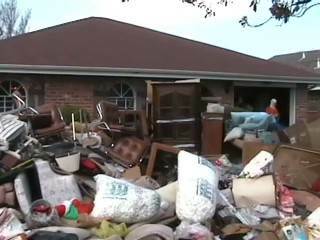 This hurricane had a devastating statewide impact on the lives the people. and has returned to New Orleans... to get on with LIFE! These photos document many trips to New Orleans, to tear down... and to rebuild. except for the massive military presence, providing safety and comfort. 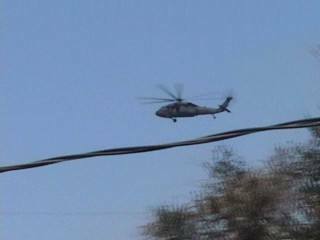 Overhead, huge military helicopters race back and forth, rescuing and recovering. Neighborhood streets are impassable... fallen old growth oaks completely swallow up streets and roads. The debris and devastation is beyond anything we can imagine. Just IDENTIFYING anything that would be recognizable is difficult. and we wonder about HER home. We're armed with face masks and industrial gloves, aware of the dangers. The carpet is still holding water, and our feet make squishy noises as we move further into the house. The humidity INSIDE the home is overpowering... and the mold has now taken hold. Breathing through the face masks, amid the heat and humidity, is miserable. 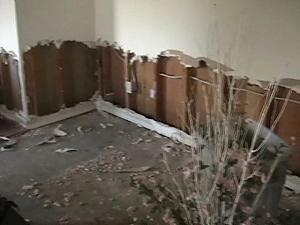 The furniture in the den(L)is soaked and covered in fast-growing mold. 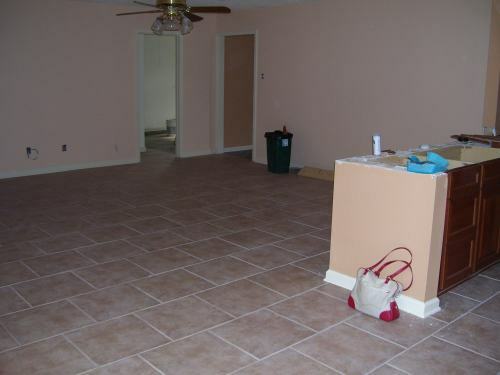 In the kitchen,(R), a newly-laid white tile floor is now black and indistinguishable. 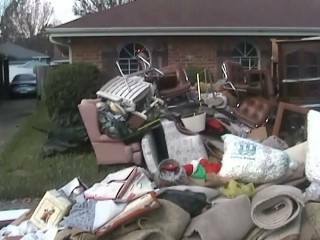 Lake Pontchatrain brought its mud when it invaded her home. Neighbors helping neighbors... everyone on her street is here this day... to salvage what they can. 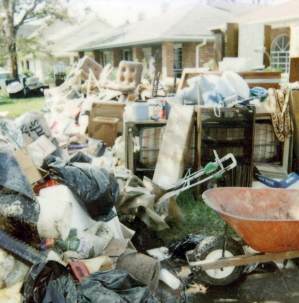 water that wicked up the walls, turning furniture and belongings into useless, wet DEBRIS. 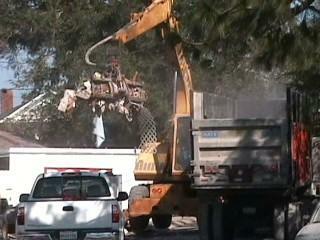 and national guard squads helping victims, still in shock, pull the debris out of their devastated homes. Now act as sponges and wicks for the water, moisture, and mold. We drive away with only what we can load into our SUV! The mold... it had taken possession. 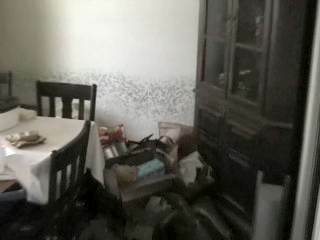 Her beautiful living & dining room... with mold growing up the walls. 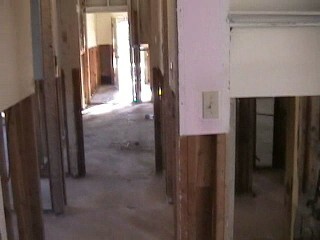 pulling out sheetrock and insulation... trying to stop the effects of the water. 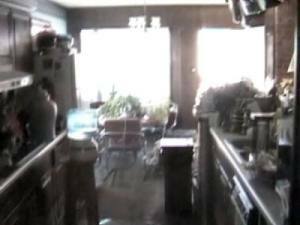 The humidity INSIDE the house takes its toll... on the video camera. 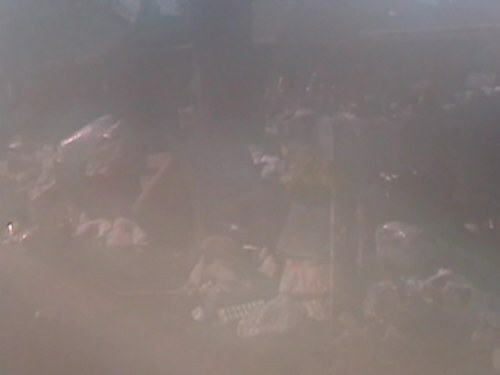 but the excessive moisture INSIDE the house has even reached into my camcorder! The reality of the situation is brought home with a jolt! We're making trips every 2 weeks, to try to get her home back on track to a full recovery. She has found an incredible contractor, an honest, capable, conscientious man... Hallelujah! This day, however, the trucks were hauling the debris away. shovel-fuls of peoples' lives into the trucks to be hauled away. on the sides of the truckbed, to handle the sheer VOLUME of debris! This trip finds the mold gone.... along with the lower portion of every wall in the house. But, now, we see its potential... we see the glass as being "half full"! 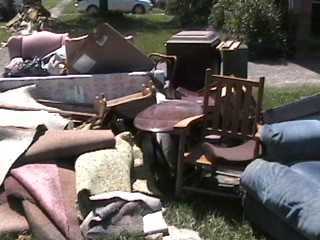 The devastation is gone, the debris is gone... now to begin to rebuild! Once-carpeted den now sports beautiful 18x18" tile..
Painting is completed... we are quite pleased with ourselves... we chose WELL! Custom kitchen cabinets have been installed... now to wait on the granite counters. 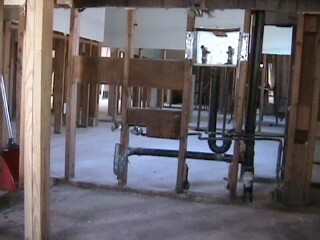 The reconstruction has been a challenge... the infrastructure in New Orleans is still in chaos. bathroom tiles... bathroom countertops... whatever can FIT in the SUV! 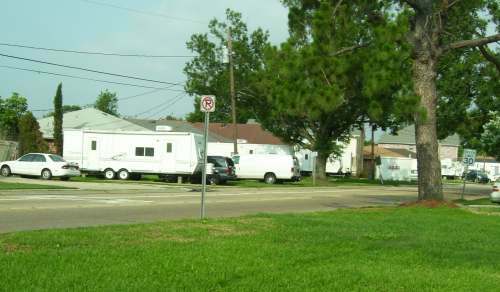 across the city, FEMA trailers sit in front yards... as people await reconstruction. This view from sister's front yard....looking TOWARD Lake Pontchatrain. 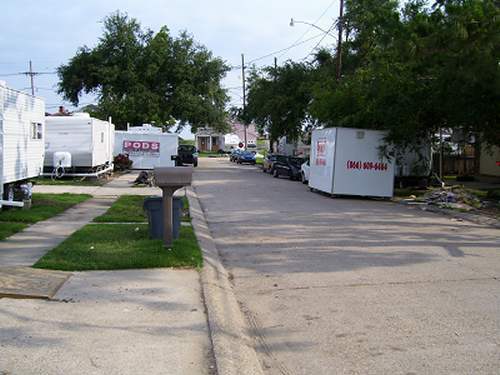 Behind that pink house at the end of the street lies Lake Pontchatrain! The journey of the last year has been one that no one ever expected to make. helping each other... helping New Orleans rebuild... friends helping friends. and for THAT, I thank GOD! After all of the destruction, the only thing left of life "before Aug 29"
�Copyright 2006 - 2015 All rights reserved.